Welcome to the GRPL Time Squeeze Challenge! Where the GeneRally racing gets stripped of its complex rules and back to the core. The goal is as simple as it gets - to set a fastest lap. No login, no AI, no strategy etc. - just launch a game, make some laps, compare with others... and repeat... Until you can't squeeze any hundredth of a second anymore! It's not a totally new idea, but I've never seen it since 2009 (Vitor's GR.F1 pre-season testing) and I thought that such a relaxed competition formula would be a nice touch for our somewhat decaying community. It is addressed mainly to those who prefer some casual racing instead of being involved in any structured competition, because don't find them interesting, or maybe too repetitive, or just want to compare theirselves with other players from time to time at various tracks and with various cars. I hope that it will be a nice supplement to our personal offline GR "routine" (if someone has still got it...) and also a chance to discuss and polish the racing technique and learn from others. 1. The competition consists of series of independent hotlap events, of which every will last one week (deadline on Sunday/Monday, midnight GMT). Every event will be announced ~1 week before its start. 2. Everyone may participate, no need to sign up. Just send me an email to generally.polska@wp.pl with your save only (without screen or track). 3. Unlimited number of trials - players may update his result by sending a save with improved laptime any time within the duration of an event (but please, don't spam my mailbox! ). 5. Player who uses wrong settings at any point of the competition will be informed about that fact and his most recent laptime with correct settings will remain as his current result. 6. There will be a dynamic results table, frequently updated with most recent laptimes from every competitor. Updates will be applied as quick and as frequently as possible, depending on the organizer's availability. 7. Along with the table there will be published a replay of current leader, available to examine by other competitors. Other players' fuel mass settings won't be disclosed until the final results, though! Or until they become the leaders. 8. If two or more drivers set the same laptime, a player who sent his save first places higher. 9. It's forbidden to use any of track elements in order to gain an unfair advantage - includes wallbouncing, corner-cutting (4 wheels.... wait, all wheels off the track (who said we're always gonna race 4-wheelers?)) and other evident infringements - as well as to modify track or cars' parameters. All players committing such acts will be either warned or removed from the competition. 10. If the author gives consent, any competitor might paint his car's livery as he wishes (modifying the car's performance, polygon, vertices or wheel position is forbidden of course). We're beginning next week and... I can't imagine that some forum member would be lazy enough to not make at least a few laps Stay tuned for the official announcement of the first event! To add some colour, I prepared 4 additional painting schemes for the R.S.17 car available for use, which serve as a little cross section of Renault's history in F1 - four modern colourful liveries along with a retro one, inspired by the 80's cars (all equal in terms of performance). I'm waiting for your saves sent at generally.polska@wp.pl. Let me remind you again that you may improve and send your times as many times as you wish and use absolutely any load of fuel at any point. Last edited by Lorenzo on Tue Aug 08, 2017 6:37 pm, edited 11 times in total. Seems cool, will try to find a few minutes for this. I don't think I'm going to enjoy this track much. Nonetheless, just made my first entry. I feel like a fast lap will push the 24 second mark so my first entry isn't going to be competitive. Added results after Day 1 - not that much happened on the track though, apart from some banker laps by Kuba and Katy. Other participants were apparently discouraged by an overwhelming heat, but I'm hearing rumours they're on their road to Hungaroring already. @Katy: It's a beautifully demanding track where the precision in throwing car into the corners and choosing right braking points are crucial and lack of consistency in any of these tight corners can really be detrimental to the lap time. I'm sure that with some time you will gain a better understanding of the circuit, surely when some players will start doing high 23's (frankly speaking, I think there are some guys around that might even challenge the 23 second mark...). Timesheet updated after Day 2. I will add sector times if I manage to get Game Analyser to work properly... currently it loads a save and a track and nothing happens then. It works fine with older files, though (saves from PGR 2011 for example), any ideas what might be a cause, anyone having similar issue? Day 3. Katy's promising time prompted me to join, let's see how low we can get. If you want your sector times to be calculated please attach also your corresponding track file with the save! Last edited by Lorenzo on Thu Aug 03, 2017 10:17 pm, edited 1 time in total. Aww, I just think I'm destined to never lead a day! Eight racers so far which is very good for nowadays GeneRally. I consider it as the sign that original (or well forgotten) idea can increase interest of bored racers. Although I remembered why non-login competitions were abandoned - I had to practice 100 laps to get those "high 23's". Nothing has whatsoever happened on Day 5, but it's still worth to mention that day 4 saw two drivers joining the 23s' club (AeroWiewiur and Buka) with that exact same time. On Day 6 maclape smashed the timesheets (hardly surprising) claiming records in every sector on top of it. Kuba also moved forward quite substantially both in terms of pace and position. Will there be any more changes on the top? The deadline should be tonight but I think we could postpone it by several days if there is no objection? This way maybe someone will still have chances to join. 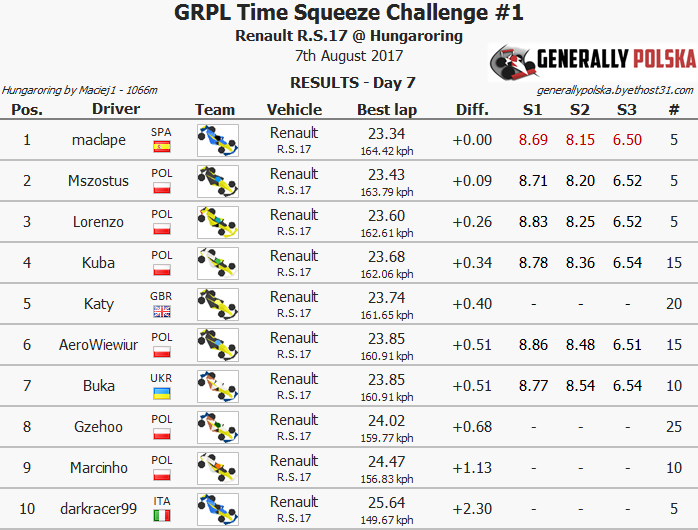 A good lap by Mszostus and P2. Deadline pushed to Friday evening, 11.08.2017! Results maybe? Or are we still racing at Hungaroring?